FlexUnit 4.x has available features for developers to plan ahead and prepare tests for classes still under development. Ignoring a test is a capability that will allow you to prototype or create tests that may not yet be relevant or operational. While the basic assertions you have used so far will accomplish much, the more advanced assertions available by using Hamcrest inside of FlexUnit 4 will reduce complexity in your test cases and increase test legibility. If you are a practitioner of test-first development, then you create each test in your system just before you create the code to make that test pass. In essence, you are defining the interface progressively. However, if you are writing tests for legacy code, or writing your tests immediately after a class is written, you can inspect the code and note the expected outcome of each method. You can then write tests that will cover these conditions. In the latter situation, it is common to write test stubs, empty functions for each required test, and implement them sequentially. The practice of creating these empty tests serves as documentation for the needed tests as they are discovered. A box of crayons contains 12 crayons each of which is a unique color. Each crayon is made of wax, has a color, and a wrapper. Each wrapper has the color name on it. You probably notice several things that need to be tested right away. Minimally, you need to test that the box has 12 crayons. You would need to test that each crayon is of type wax, has a color and a wrapper. You would need to test that the wrapper has a color name and that the color name is the same as the color of the crayon it wraps. Finally, you would need to test that each crayon color is unique. You now have a road map for testing. Currently none of these tests actually verify functionality. As noted previously, the lack of a failing assertion is a success so all of these tests would pass. Excellent, testing complete! If only the world were so easy. In reality, these tests are far from complete, the fact that all these incomplete tests will pass is a problem that needs to be addressed. Leave them as stubs - Stubbed tests still show in the test complete dialogue. They will always be marked as passing. It is very easy to forget to implement these tests and it artificially appears as though you have many valid tests. Comment the tests out - These tests will not show in the complete dialogue. Like stub tests, it is very easy to forget to complete these tests as there is no visible reminder. Add a special type of assertion named fail() inside each method - This type of assertion always marks a test as a failure. This is effective, and certainly serves as a reminder that the test needs to be completed, but not the best solution as it artificially appears as though you have many failing tests. Ignoring - This will mark the tests in the complete dialogue without marking them as failures. When ignoring, you will receive a reminder that these tests need to be implemented but without the side effect of artificial statistics. This is the best way to deal with incomplete tests. The [Ignore] metadata can also be applied to tests that have been written for a particular case, but the actual components or methods that they need to test are non-existent. For example, in the crayon example above, you may want to write the wrapper test before the wrapper class. Finally, they can also be useful to hold on to deprecated tests that may be relevant again at a later point. Comment out several test methods. Alternatively, if you didn't complete the previous lesson or your code is not functioning properly, you can import the FlexUnit4Training_wt1.fxp project from the Unit 5/Start folder. Please refer to Unit 2: Walkthrough 1 for instructions on importing a Flash Builder project. Highlight the text that comprises the shouldGetBottomPointOnCircle() function. Press Shift+Control+c (Shift+Command+C on MacOS) and the comment markers (/* and */) should be added as shown. 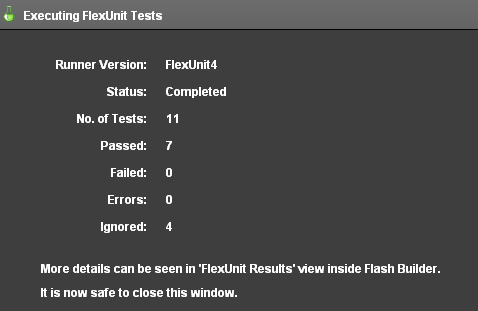 Run the FlexUnit4Training.mxml file again. Re-Open the BasicCircleTest.as file. Remove the comments by highlighting the commented shouldGetBottomPointOnCircle() function and pressing Shift+Control+c. This command will remove the comment markers. The function should look as it did at the start of this walkthrough. Add a line with [Ignore] metadata above the [Test] metadata of the shouldGetBottomPointOnCircle() function. Similarly, mark the shouldGetRightPointOnCircle, shouldGetLeftPointOnCircle() and shouldThrowRangeError() test method with ignore metadata. As you have just demonstrated, [Ignore] provides a useful way of indicating that a test exists but is, for whatever reason, not ready to run at this time. Ignoring a test ensures that the test is not lost in comments and forgotten. The [Ignore] metadata provides a few additional benefits over commenting. First, the [Ignore] metadata can accept additional system and user defined arguments. This additional information can be used for filtering, sorting and reporting on some test systems. 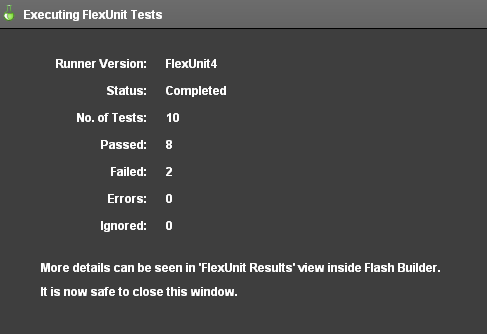 Unfortunately, at this time, Flash Builder does not display this extra information to its users. However, it does provide one useful function when using [Ignore]: Flash Builder Premium will display the ignored tests in the case hierarchy. This means you can easily find and click on an ignored method to quickly find it in a large project. Standard assertions work well for many cases. However, as the complexity of your tests increases, you may find yourself with long, complicated compound assertions. For example: what if you needed to ensure that the result of a method call was an array that contained at least two specific values? Ideally, tests not only verify functionality but are also a portion of the documentation for the system. This is only possible if the tests are clear, concise and legible. Further, in cases like the array examples above, you would end up with significant logic in your tests. Any place where logic exists needs to be considered suspect unless there are tests to verify that functionality, and we simply can't recommend writing tests for your tests. "Expected <true> but was <false>." This information, while true, is not all that useful for instant problem identification. This lack of information forces the developer back to the original test to understand what was being tested and helps defeat one of the key advantages of having tests. Hamcrest is an open source library of matchers, which are simple classes that perform comparisons. These matchers, along with encompassing logic, allow Hamcrest to perform complicated matching with a simple and extensible syntax. Hamcrest itself is neither a unit testing library, nor specifically made to work with unit tests, but the matchers it exposes are used by FlexUnit to provide a powerful and flexible way to move beyond basic assertions. When using Hamcrest assertions in FlexUnit, you use a special function named assertThat(). Unlike the assertions used so far, the assertThat() method does not inherently prescribe any specific type of comparison or evaluation. Instead, you provide a value and a matcher. It is the matcher that dictates the type of comparison. There are several advantages to the Hamcrest assertion. First, this statement could be read by someone with little testing or development experience and would still be understandable. "Expected a number between <num2> and <num3> but was <num1>." This particular assertion uses the is() and between() matchers to create a more readable assertion. These are just two of the many types of matchers offered by Hamcrest. Further, as each matcher is simply a class that implements a specific interface, you are encouraged to create your own matchers to make even the most difficult matching clear inside of your test cases. For more information on Hamcrest and extensible matchers, check out the Hamcrest-as3 page on github available at http://github.com/drewbourne/hamcrest-as3. There were three test failures in Unit 4: Walkthrough 3 because the assertEquals() statement is used to judge equality, which seems logical on the surface. However, there are many times when a computer's concept of equal and our concept of 'equal enough' are not the same. This was the only of the four new point tests that called circle.getPointOnCircle() with an argument of 0. The other three point tests called circle.getPointOnCircle() with Math.PI/2, Math.PI, and (3*Math.PI)/2. Pi is an irrational number that cannot be expressed exactly. Further, Flash Player itself can only store large numbers to a certain precision. This means that calculations involving any floating point value, and especially an irrational one like Pi, will always have a margin of error. Both of these calculations are correct within a very acceptable margin of error. However, we told FlexUnit, and hence Flash Player, that they needed to be exactly equal. The problem comes with the specificity of our request, not the test. To that end, we need a way to explain to FlexUnit that we are okay with a margin of error. While the standard assertions can't provide that for us, Hamcrest can. Use the assertThat() statement with extensible assertions. Open the FlexUnit4Training.mxml file from the previous exercise. Alternatively, if you didn't complete the previous lesson or your code is not functioning properly, you can import the FlexUnit4Training_wt2.fxp project from the Unit 5/Start folder. Please refer to Unit 2: Walkthrough 1 for instructions on importing a Flash Builder project. At the top of the BasicCircleTest class declare a private, static constant with the name of TOLERANCE and a data type of Number. Set the constant equal to .0001. We will use this value to determine "close enough." If the result is between our expected value plus or minus the tolerance, we are willing to consider the value to be close enough. Replace the first assertEquals() assertion of the shouldgetTopPointOnCircle() function with the assertThat() statement as shown. Be sure to either use the code complete with assertThat and closeTo, or manually add their imports. Remove [Ignore] metadata from the shouldGetBottomPointOnCircle(), shouldGetLeftPointOnCircle() and shouldGetRightPointOnCircle() methods. Unlike assertEquals(), the closeTo() Hamcrest matcher specifies that we need to look for numerical equivalence within a specific margin of error. Change all the point tests so that each uses the assertThat() statement in place of assertEquals(). Run the FlexUnit4Training.mxml file. If the tests ran successfully, you should see the following output. The Hamcrest library includes base matchers to cover a wide variety of potential situations. You are encouraged to create your own custom matchers when encountering a situation that can be handled more easily, or more clearly, with a new matcher. Neither you, nor another individual that may read this code later, really cares that the point's x and y properties are within a tolerance. What you really care about is that one Point is close to another Point within a given tolerance. While this is a simple example, custom matchers continue to become more effective as the complexity of your tests grows. Custom matcher classes extend the TypeSafeMatcher class. Basic custom matchers are written with three methods. Used to provide the values being matched. Accepts an item of data type Object that will be compared to the provided values. You perform any logic to determine if the values match or not in this method and return a Boolean indicating the result. Used to create the informative error descriptions characteristic of Hamcrest. This should return the descriptive string. 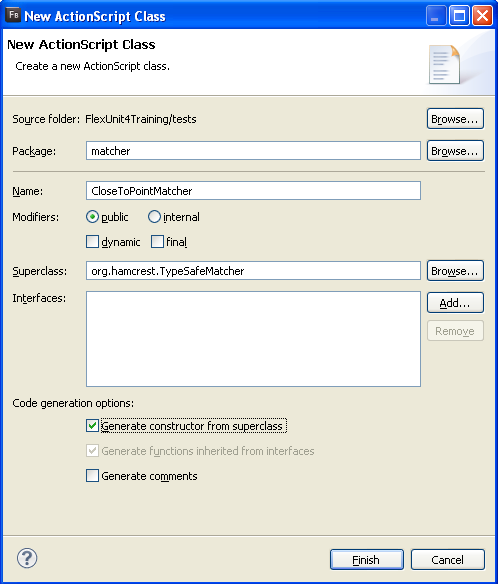 Create a new ActionScript package. Use the custom matcher in the getPointOnCircle() tests. Alternatively, if you didn't complete the previous lesson or your code is not functioning properly, you can import the FlexUnit4Training_wt3.fxp project from the Unit 5/Start folder. Please refer to Unit 2: Walkthrough 1 for instructions on importing a Flash Builder project. Within the tests directory, create another package named matcher. 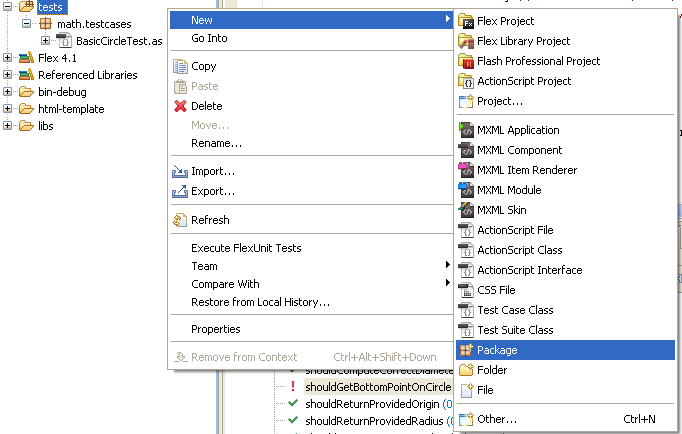 Right click on the tests directory and choose New > Package. The Name should be matcher. You will now need to create a new class within the helper package. 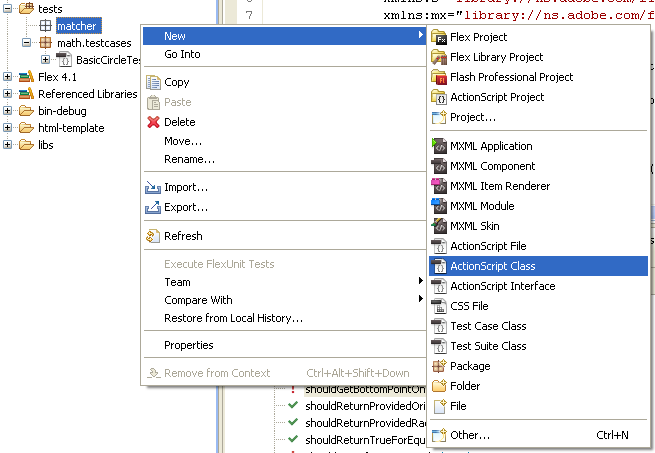 Right click on the package and choose New > ActionScript Class. The class should be named CloseToPointMatcher and its Superclass should be org.hamcrest.TypeSafeMatcher. Modifiers should be set to public and the Generate constructor from superclass option should be checked. Click Finish. Open the CloseToPointMatcher.as file from the matcher package. Add a private variable named point of type Point and another named tolerance of data type Number to the class. If you did not use code-completion, add the import for flash.geom.Point at this time. Modify the automatically created CloseToPointMatcher() constructor. To accept point and tolerance parameters, instead of an expectedType. Pass a reference of the Point class to the superclass's constructor, and populate the local circle and offset properties with the appropriate argument from the constructor. The super(Point) declaration is informing the classes the data types that the class will be dealing with is a Point class. Override the matchesSafely() method of the class. It will take an argument named item of data type Object, and will return a Boolean. Add a return statement that checks if the tolerance subtracted from the absolute value of the distance is less than 0. Add an override for the public function describeTo(). It will take an argument named description of type Description. Because there are two available Description classes, make sure to choose the org.hamcrest.Description class when you use code completion. If you did not use code-completion, add the import for org.hamcrest.Description. Modify the shouldGetTopPointOnCircle() method so that it reads as follows. Each of the point testing functions should follow this format. Instantiate the circle, instantiate the expected point, and finish with the assertion. There are times when your code should throw an error in response to a given situation, such as when an illegal value or null is provided to a required property. In these cases the actual outcome of a test is not to assert a condition but to verify that the error was thrown as expected. If an error is NOT thrown in this situation, it should be considered a failure while throwing the error would be a success. This logical inversion is often handled by wrapping all testing functionality in try-catch blocks. However, this leads to ugly, illegible and difficult to maintain code. FlexUnit 4 simplifies this process by allowing an expects argument in the Test annotation for this purpose. To use the expects annotation, simply provide the type of error expected. The expects="" attribute only verifies the type of the error, it does not evaluate the properties of the error instance. If you need to verify data internal to the error you must catch the error yourself and perform assertions. In most cases, the expects="" attribute works well as the existence of the error is often most important. Add a statement that will throw an error when the tests are run. Handle a desired exception using expects="" attribute. Alternatively, if you didn't complete the previous lesson or your code is not functioning properly, you can import the FlexUnit4Training_wt4.fxp project from the Unit5/Start folder. Please refer to Unit 2: Walkthrough 1 for instructions on importing a Flash Builder project. At the end of the BasicCircleTest class there is an ignored test method named shouldThrowRangeError(). Remove the [Ignore] metadata from this function and declare a variable named someCircle of type Circle. Instantiate the Circle with an origin of (10, 10) and a radius of -5. The shouldThrowRangeError() test is throwing an error. The error comes from the test's attempt to instantiate a Circle object with a radius of -5. Even without looking at the code, one could conclude that a Circle with a negative radius has conceptual issues. Notice that FlexUnit is registering the error without any assertion statement present in the function. 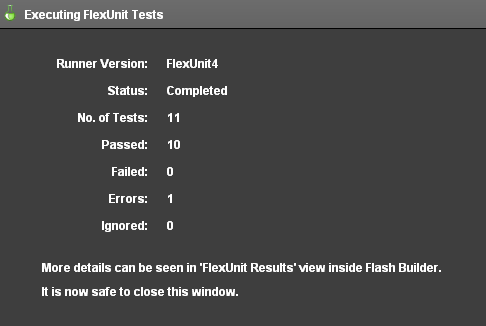 If a test method throws an error at any point, FlexUnit will register that method as an error. When a test fails due to a failed assertion, it is considered a failure. When it fails due to a run time exception, it is considered an error. While the result is the same, a test that does not pass, errors are generally considered more heinous as they indicate an unhandled exception. Return to the BasicCircleTest class. Modify the [Test] metadata tag on the line above the shouldThrowRangeError() function to indicate that it expects a RangeError. RangeError exists in the default package, and hence appears to just be the class name. For your own custom errors or errors defined in the Flex framework, it is important you provide the full path. The shouldThrowRangeError() method has still thrown an error. 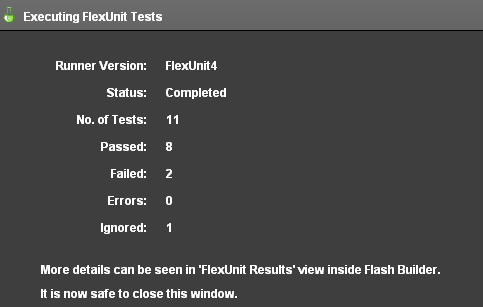 Because of the expects="RangeError" metadata, FlexUnit knows that this is the expected condition. 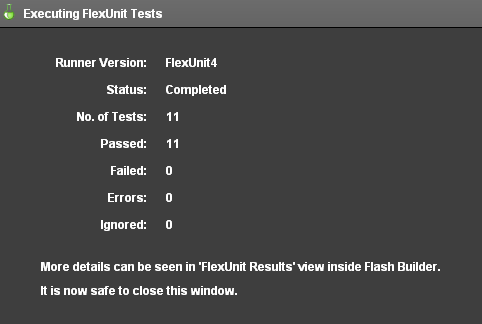 If that particular error is not thrown, FlexUnit considers it a failure for the test. You can create a roadmap for testing by writing out all the expected tests without functionality. Marking tests with [Ignore] metadata is the best way to ensure that you are aware of incomplete test methods. Test methods should be written with as few assertions per test as possible. You can write custom matchers for use with the assertThat() method. The expects="" attribute of [Test] annotation can be used to handle expected exceptions in your tests.